Description: Sometimes words don't adequately describe the touch or feel of something. That is the case with this lovely new stationery. The paper has a feel to it that is smooth, but isn't quite smooth, has just enough texture to give it this to want to touch it! 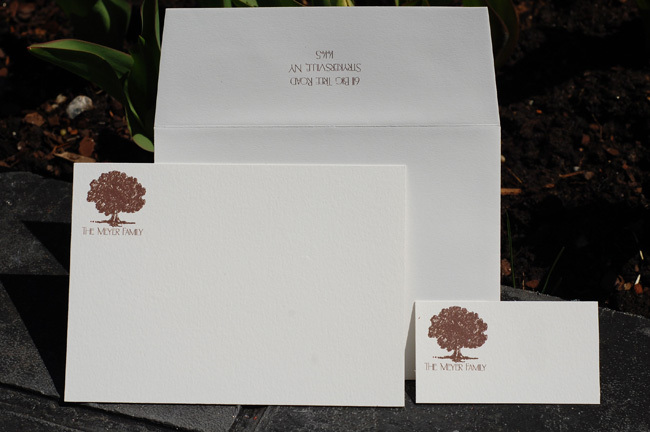 The letterpress printing process is very, very old, in fact the printing press (Gertrude) for this stationery is over 100 years old. Something with that much history is traditional, but with the variety of motifs, momograms and fonts you can make it traditional or modern as you choose! But be sure to allow plenty of time, this could take 3-4 weeks for delivery.